Sweden is the only country I’ve been to before that we are visiting on this year abroad. And Stockholm is the only city I’ve previously been to. Nearly 20 years ago, my mom and I took a trip to Sweden and Norway, but we only spent a day or two in Stockholm. This was my opportunity to really explore the city. And this time, I was looking for things to do in Stockholm with kids. 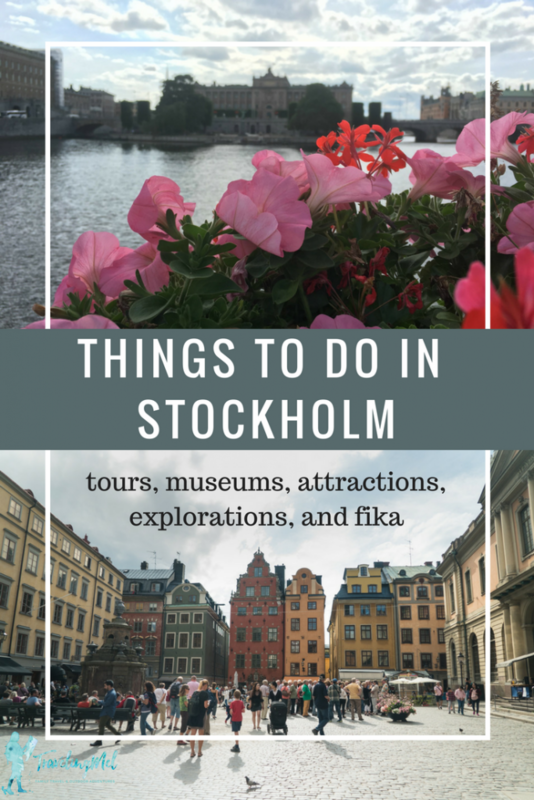 Fortunately, most of the things I want to do in Stockholm with family, are the same things I’d do without them, so my Stockholm with kids itinerary could also be a general things to do in Stockholm, Sweden. Gamla Stan – the old town and an island smack dab in the middle of it all. Picture colorful buildings and winding, cobblestone streets. It’s where the city originated and where the Royal Palace is situated. Södermalm – an island with the trendy, hipster neighborhood. As its name suggests (Söder = South), it’s to the south of the inner city. Kungsholmen – an island on the west side of the inner city with City Hall and relaxed neighborhoods. This is the most suburban neighborhood in the inner city. Use this guide on where to stay in Stockholm to choose a neighborhood. Check out this Stockholm map to get yourself oriented. 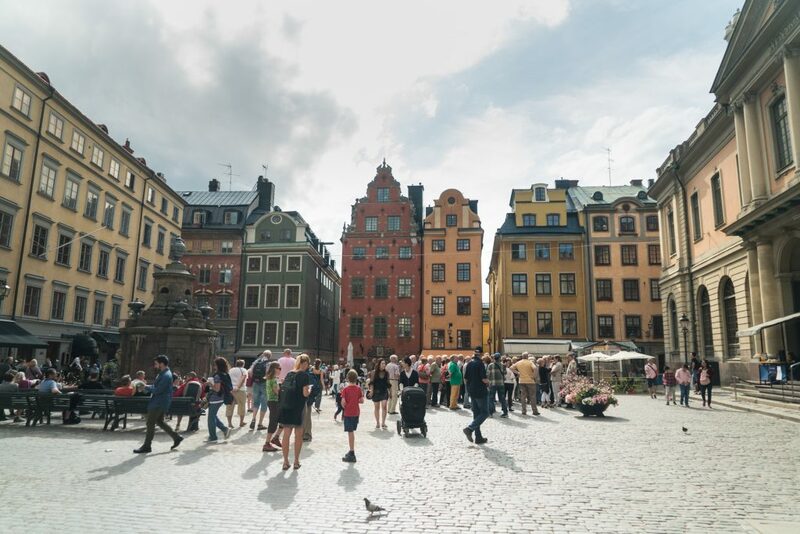 This is also helpful in planning what to do in Stockholm so you can group your visits to one island or part of the city, although it’s pretty easy to get from one part of the inner city to another. Uh, yeah. It’s pricey. But there are ways to make it cheaper. Stay outside the city — We rented an apartment south of the city that was way more affordable than any Stockholm hotel. It was a ten-minute walk from the train station and a 20 minute ride to Stockholm City, so we could be in the city in half an hour. 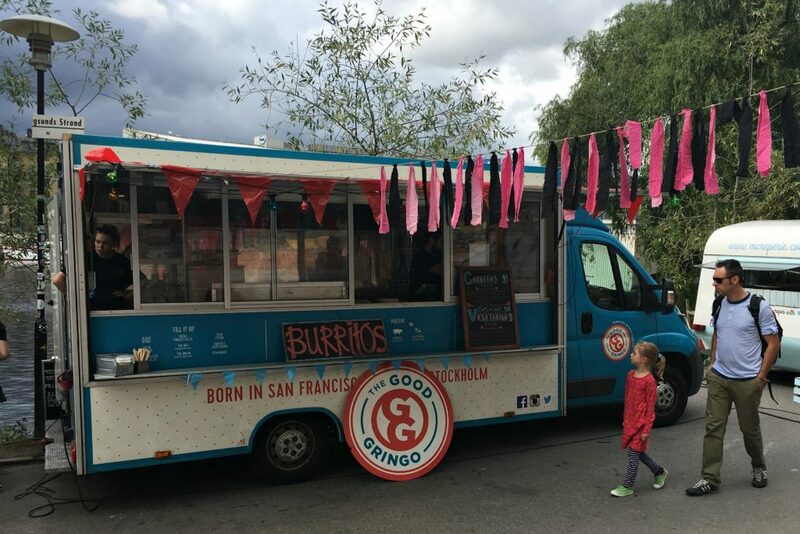 Shop and cook – We bought almost all of our food at the grocery store and cooked at the apartment or picnicked when we were out and about. It would have been so much more fun to eat out, but that’s what makes Stockholm so expensive. The restaurants are outrageously pricey. We splurged a few times for fika (more later) and got to taste some of Sweden’s famous kanalbulle (cinnamon buns), but most meals were store-purchased. Alcohol is expensive, too, and we barely drank while we were in Sweden. Coming from Austria and Montenegro where beer is cheap, good, and abundant, it was probably a good thing for us to dry out for a bit. Free things to do in Stockholm – There are many free museums and parks in Stockholm, not to mention free tours. Take advantage of those. Stockholm Pass – For Stockholm points of interest that weren’t free, we used the Stockholm Pass. It gets you into more than 60 Stockholm attractions, boat and bus tours of Stockholm, and comes with a Stockholm travel guide of what to see in Stockholm and a map of Stockholm. We started the day at the Stockholm Visitor Center in Sergels Torg to pick up our Stockholm city pass, called the Stockholm Pass. They are super helpful there and tell you all kinds of things to do in Sweden. But, we already had a plan for our Stockholm tourism, so we headed to the top of the stairs at Sergels Torg to meet our free Stockholm walking tour. Tip: If you are going to be using the commuter trains, T-bana, buses, or ferries, like we did, get an SL Access card and a Travelcard. The Access card costs SEK 20 and each person needs their own. Then you load it with the Travelcard. Travelcards are good for one, three, or seven days. Look at the SL site for the best options and then download the SL Journey Planner app for easy scheduling. Free Walking Tour – If you read this blog at all, you know we love free walking tours of whatever city we are visiting. 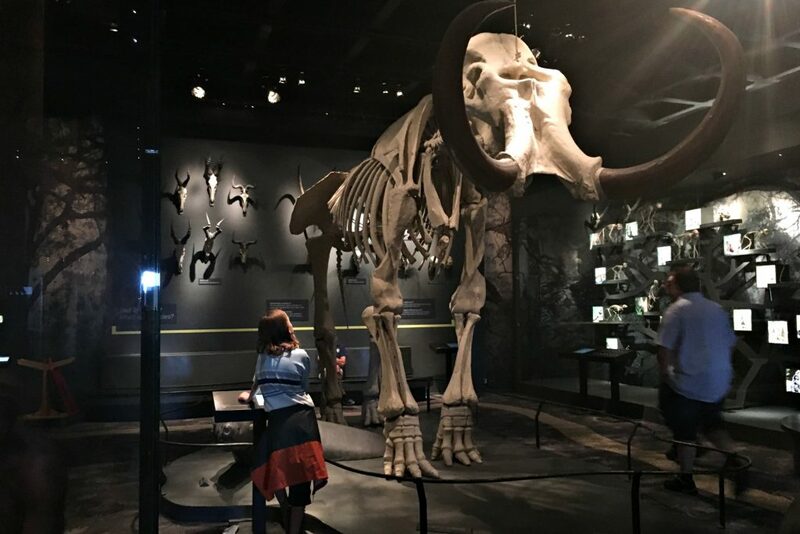 Since they work for tips on these free tours, you usually get a really great experience. Our tours in Stockholm were no different. We met Ryan from Free Tour Stockholm and got a thorough and humorous overview of the city. We saw the main streets, Drottninggatan and Kungsgatan, heard about Swedish companies like Ikea and H&M, saw where the Nobel prizes are awarded in Sweden, learned about Swedish Royalty, and saw the bank where the term “Stockholm Syndrome” was invented. Ryan also told us the best places to visit in Stockholm on the rest of our trip. 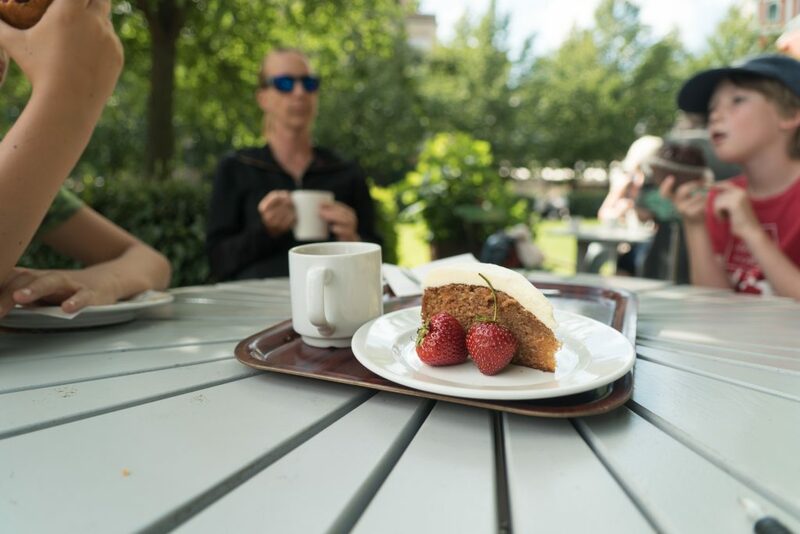 Fika – After the tour we found an outdoor café in Kungsträdgården or the “King’s Garden.” One aspect of Swedish culture that we really dug into was fika. Fika is drinking coffee in the afternoon, often with a pastry. I generally go for tea while the kids choose water, but the idea is the same. Sitting outside in the park, admiring the flowers, and having a little caffeine is one of my favorite things to do in Stockholm. 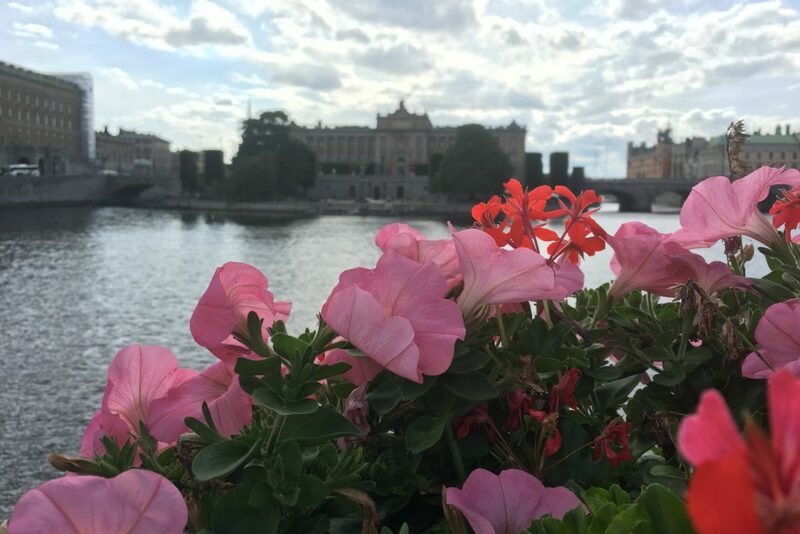 Stockholm Boat Tour – Fika was followed by Stromma’s Royal Canal Tour Stockholm. This is included in the Stockholm Pass, so we walked to the nearby dock, Strömkajen, and hopped on the boat. We didn’t love this tour, but as far as Stockholm travel goes, it’s a nice way to get around. You sit low in the boat and it’s covered, so it’s hard to see some of the Stockholm landmarks. However, we did learn something from the commentary, which was nice. It also gave us some ideas of the best places to visit in Stockholm. I can see how this would be great in a rainy or cold day since you are inside. Gamla Stan – From the boat tour dock, we walked over to Gamla Stan, or the Stockholm old town. This is a nice place to wander around the narrow streets, pop in and out of shops and do some Stockholm sightseeing. If we hadn’t done the city walking tour in the morning, I would have loved to take Free Tour Stockholm’s Old City Tour. Our second day in Stockholm was probably the most typical kid-friendly day. If you look up a list of things to do in Sweden, this would be at the top. We took the commuter train into the city and then the ferry from Stockholm Slussen Kajen on Gamla Stan to the island of Djurgården. 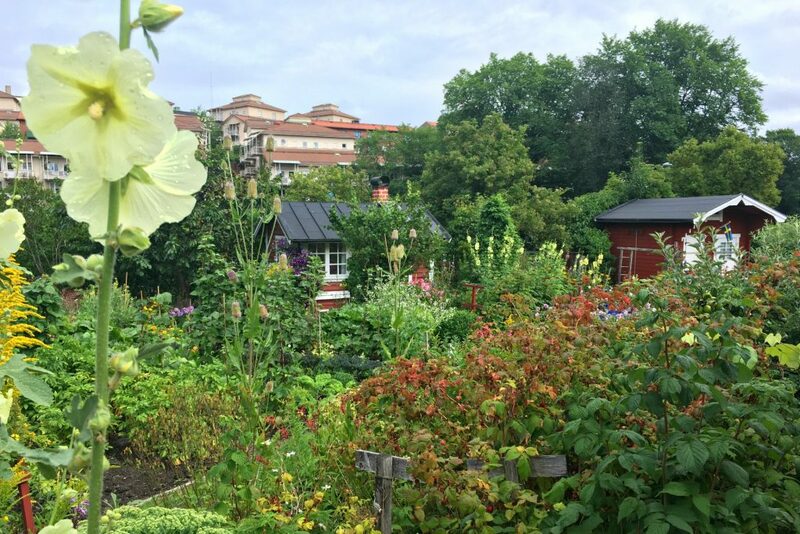 If you visit Stockholm you are probably going to want to go to Djurgården since it has so many Stockholm things to do including the open air museum, Skansen, the Vasa Museum, Gröna Lund amusement park, ABBA the Museum, and other attractions in Stockholm. We only made it to Skansen and the Vasa Museum, but I could have easily spent another day or two here walking through the park and visiting some of the 22 other Stockholm Museums on the island. Here are some of the things on Djurgården so you can do depending on how much time you have. I can’t cover them all here, so I’ll link to a list of all the museums and attractions. Skansen is the world’s oldest open air museum and is sometimes called “Little Sweden.” There are homes and buildings from all over the country and all time periods so you can see how people lived. Some of the buildings are open to explore and docents in period costumes tell you about what it would have been like to live there. There are also festivals, concerts, and other events. There is a zoo of Nordic animals. There are also several day trips from Stockholm that will enhance your visit. 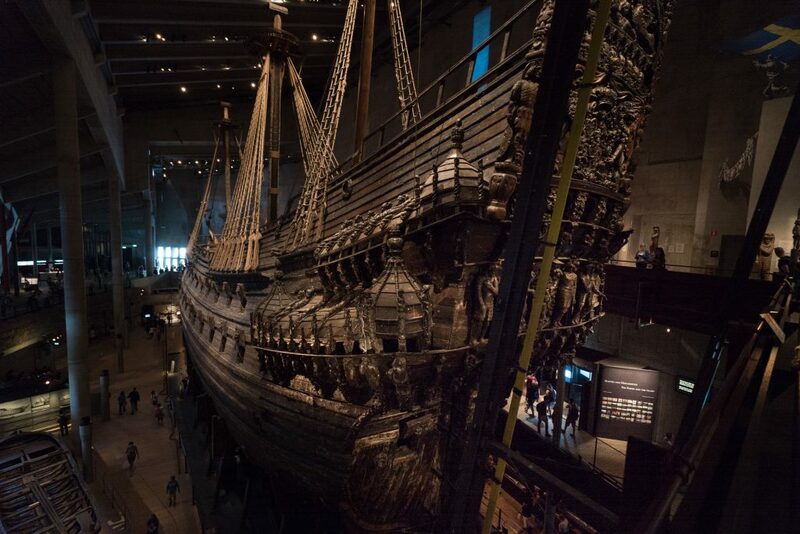 Vasa Museet – Vasa Museum Stockholm is home to the world’s only preserved 17th century ship. The whole thing. It capsized immediately after setting sail in 1628 and spent 333 years on the sea floor. It is elaborately decorated and huge. This was supremely interesting and well done. There are free tours in English every hour on the half hour and it’s worth jumping on one of those. Nordiska Museet – Nordic Museum Stockholm holds 500 years of Swedish history in an imposing building. “The Nordic Museum is Sweden’s largest museum of cultural history. An everyday palace, and a place of stories about the life and people of the Nordic region – yesterday, today and tomorrow. ABBA the Museum showcases Sweden’s most famous band. It looks kitschy and fun. You can even eat at the Mama Mia Greek tavern. Junibacken is little amusement park/interactive museum based on Swedish children’s literature. If you are looking for something in Stockholm for children to learn about Swedish culture, this is the place. The Story Train is a ride through the stories of Astrid Lindgren (author of Pippi Longstocking) and other Swedish stories. It’s also home to Sweden’s largest children’s bookstore. Tekniska Museet – Swedish National Museum of Science and Technology is the Stockholm museum I wish we had gotten to. Our kids would have loved the experiments and figuring out how things work. If you only have two days, check this post. 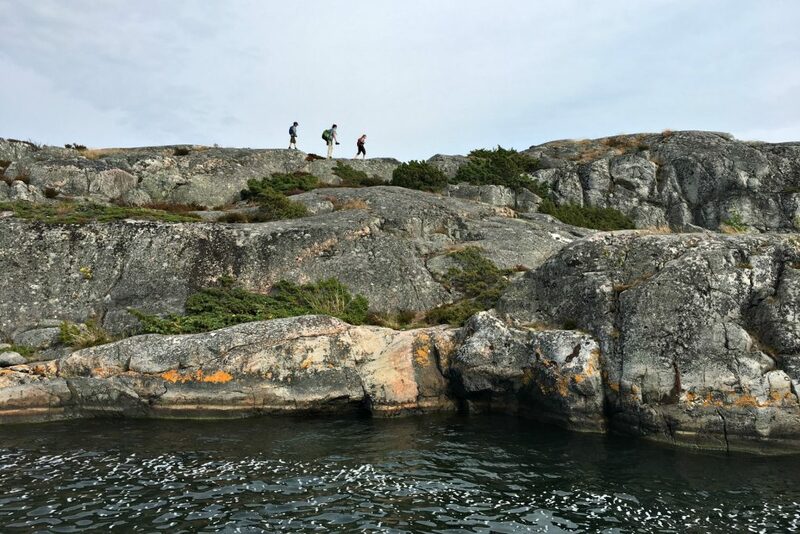 On this full day trip from Stockholm, we cruised through the archipelago on the classic archipelago boat M/S Waxholm III, stopping at three islands to explore. It’s a long day – 11 hours—but the best way to see the Stockholm archipelago. 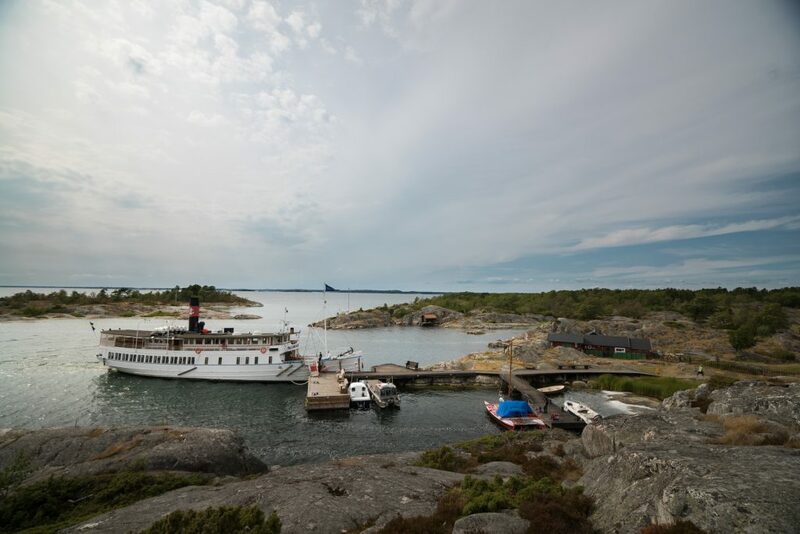 The boat leaves the busyness of Stockholm for the quiet, granite and tree islands in the archipelago. The first island we stopped at was Kymmendo, an island that author August Strindberg lived on and was inspired by. The second island was Bullerö, part of a national park. This was our favorite stop as it was wild and we could run across the rocks. The third stop was popular Sandhamn, a cute, touristy spot and the island that Blomqvist from The Girl with the Dragon Tattoo had a summer cottage. And there were plenty of red Stockholm summer houses to see along the way. 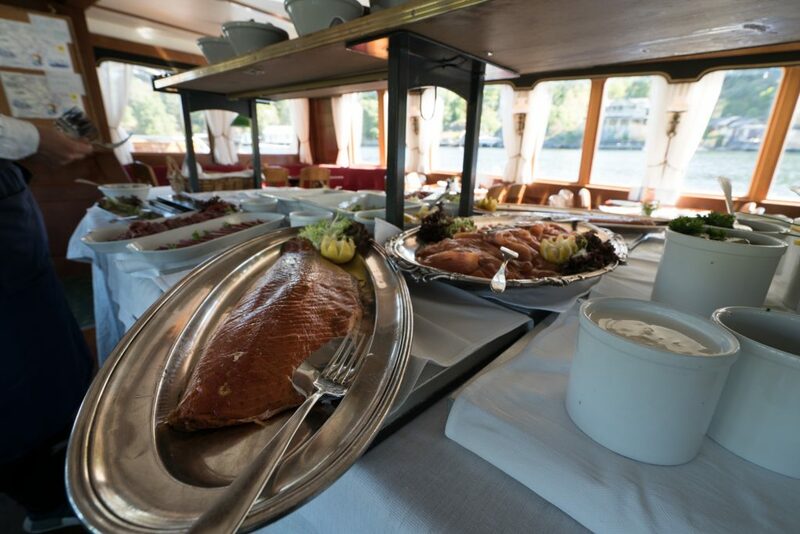 In addition to the scenery and guiding we got on the trip, including lots of facts about Sweden for kids and adults, the Stromma Stockholm boat tours have excellent food. Drinks are separate, but we indulged in morning tea/coffee, a lunch buffet of typical Swedish cuisine (herring done several ways), fika, and a gourmet dinner, which were all included. As far Stockholm day tips go, this one was a winner. We decided to split up for the majority of the day because we had different ideas on the top things to do in Stockholm Sweden. Actually, we all would have liked to do what the others were doing, but you can only fit in so much. Anders and I went to the Swedish Museum of Natural History while Henry and Finn toured the History Museum. Naturhistoriska riksmuseet – Natural History Museum Stockholm was one of our favorite museums in Stockholm. Anders and I spent a couple hours there, but could have stayed longer. Most of the exhibits are in English as well as Swedish, and you can pick up teaching materials in English to learn even more. For younger kids there is Skogsmulle’s Discovery Trail where you follow the exhibits to find Skogsmulle’s red hat-feather. And there is an Imax theater there, but we ran out of time. Historiska Museet –Swedish History Museum may be one of the top ten things to do in Stockholm Sweden, especially if you are into history. It’s definitely one of the biggest museums in Sweden. Henry and Finn thought the highlights included the gold and silver treasure and the world’s largest Viking exhibit. Local Events – After the museum visit, Anders and I watched the Stockholm Pride Parade. It was so fun being two of hundreds of thousands of people watching or participating in the parade. You probably can’t go to the Pride Parade unless you are there on one specific day each year, but you can check the calendar of events to see what else is on in Stockholm. Context Travel Tour – I think you could do Stockholm tours the whole time you are in the city – there are so many. We chose Context Travel’s Royal Sweden Tour for this evening since we had such a great experience with Context Travel at the Louvre in Paris. We met our guide outside the Royal Palace in Gamla Stan and went inside to tour the palace. Elisabeth took us through the rooms giving us a primer on Swedish royalty, how they lived, and how they governed. Since Context Travel only does really small group tours (in our case, just the four of us), you get to ask all the questions. And they are really great about tailoring the experience to you. We enjoyed the Högvagten—the changing of the guards at the Royal Palace before wandering around Gamla Stan. Elisabeth showed us Stockholm’s smallest statue, the House of Nobility, famous churches, and gave us an overall history of the island where this city began. She also gave us some ideas of other things to see in Sweden and what to do in Stockholm Sweden. Context Travel does tours for the “intellectually curious traveler” all over the world. This was another day where we split up. Henry and the boys went to the Birka Viking Village while I planned to walk around Södermalm and Djurgården. The rain put a bit of a damper on all of our plans, but I still think we found some of the best things to do in Stockholm. 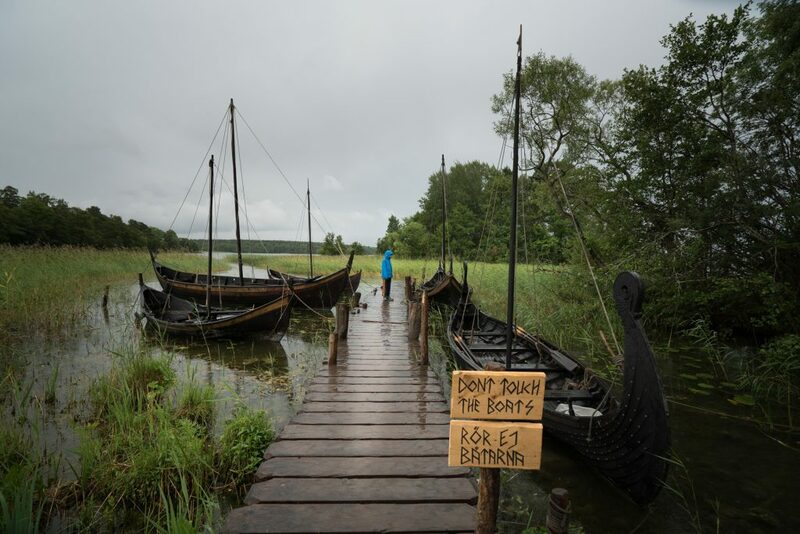 Birka Vikingastaden – Birka Viking Village is considered Sweden’s first city. It’s on the island of Björkö in Lake Mälaren and was an important trading center for the Vikings. To get there you take a boat from the City Hall in Stockholm (Stadshusbron brygga) with Stromma. It’s about a two-hour cruise and you can get lunch on the boat or not. If you aren’t using a Stockholm Pass, make your reservation ahead of time to ensure your spot. If you are using a Stockholm Pass, you just have to show up at the boat half an hour before it leaves and hope you get a spot. Birka is one of the great attractions in Stockholm for kids because there is a lot of interactive, living history stuff going on there. Plus, who doesn’t love Vikings? Unfortunately, some of it was canceled while Henry and the kids were there because of the rain. There is a guided tour of the archaeological fields and the Birka Museum. You can also visit the reconstructed Viking village with its typical forges and weaving cabins. Walking – For me, one of the cool things to do in Stockholm was just walking around Södermalm. I didn’t have a plan, but wandered through Tantolunden Park and the Tanto Norra allotments. Tanto Norra was established in the early 19th century to help the poor grow their own food during a time of famine, World War, and food-rationing crisis. Now, Tanto Norra consists of 93 allotments. These allotment gardens at Tanto are dotted with tiny cottages and large, flowery gardens. From there is was on to Hornstulls Strand and food trucks. 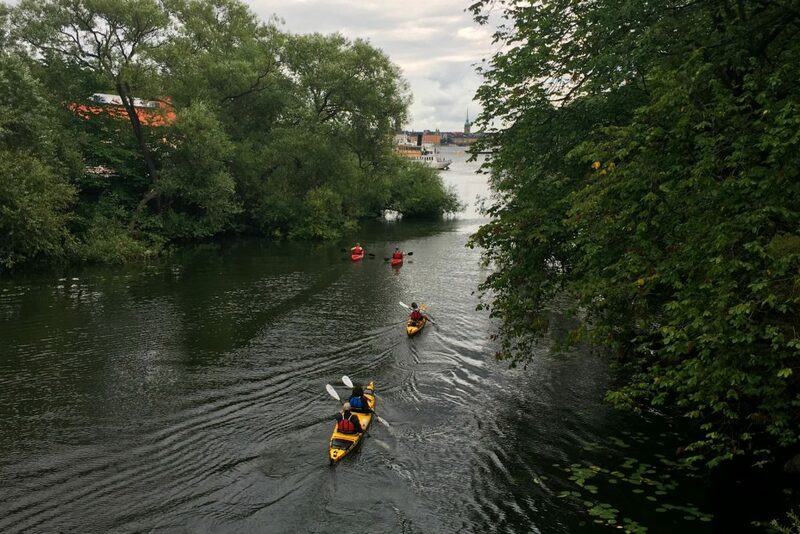 I wandered along Pålsundet and watched urban kayakers pass beautiful wooden boats. Then is started raining and didn’t stop. I ditched my plans for taking the ferry to Djurgården and walking in the park and instead ducked into a coffee shop for fika. 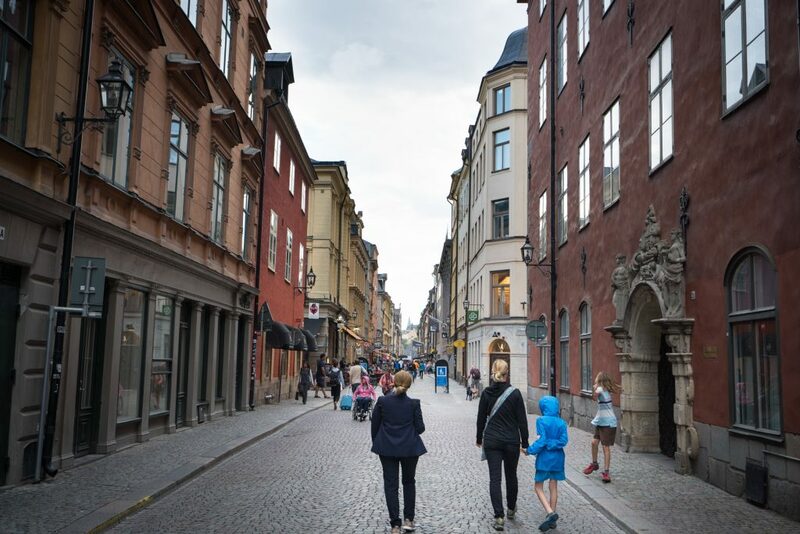 What as some of your favorite things to do in Stockholm with children…or without? Even though I don’t have kids, these are still some really cool things I would love to experience. I am sure with extra mouths to feed and tickets to buy, it’s great you mentioned how to be somewhat frugal when it comes to traveling here. Even when it’s just me and my boyfriend we usually stay outside of the city and cook some of our own meals (like in Paris for example!) great tips!! Honestly, I think I would do almost all the same things whether we had the kids with us or not! Scandinavia is a region that continues to elude me in my recent travels. I’ve only been to Norway once, in winter. Your post on Stockholm really encourages me to get there, even just to indulge in fika or check out Gamla Stan. I would also love to go sailing! It would be great to go sailing and so very Swedish! I have visited Stockholm a few years ago for the second time and fell in love with the city again. Same as you, I have used the Stockholm card and saved a lot of money on attractions! I was there for Midsummer so Skansen was the perfect place to watch the entire capital celebrate with flowers, dances and open air BBQs. It was so pretty and everyone was so jolly! I would love to be there for midsommer! We spent it in Goteburg one year and loved dancing around the flower strewn pole! What a lovely detailed post, I’m pinning it for my future travel. The photographs are amazing and could encourage anyone to visit Stockholm. 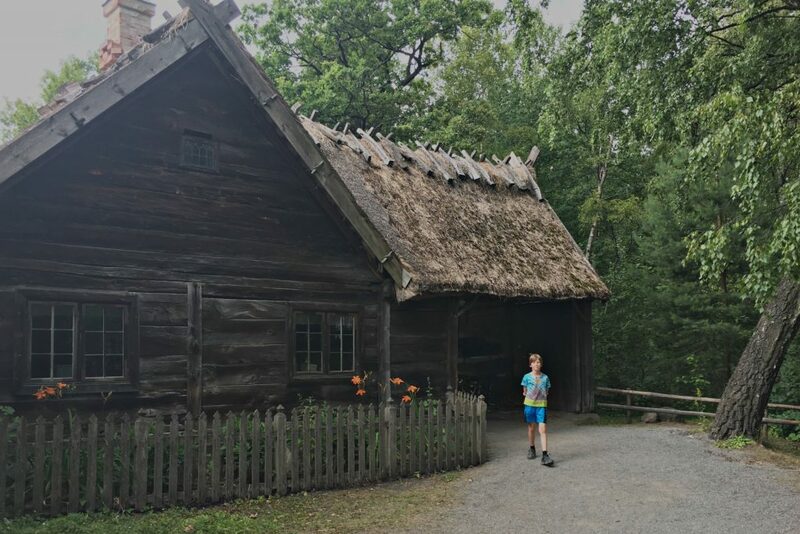 Loved the Skansen museum, I would surely include all the museums in my itinerary. Thanks for sharing. This is such a fabulous story on what you all did and I so enjoyed it and of course will pass it onward!!! Very comprehensive details on visit to Stockholm with kids. I loved the option of staying outside from city as it is much cheaper than living in city center. Would love to do Stockholm boat tour and walk around Gamla stan – old city tour to capture nice shots and get the feel of Scandinavian country. Useful tips and very informative. Thanks! I hope you make it to Stockholm – it’s such a great city. I love Nordic countries but damn they are so expensive. And when you have to go with kids it becomes even more expensive. you seemed to have had such a great time there. Thanks for such a detailed post. Saving it for my next trip. have been with you in spirit and enjoyed your travels as I have, I bet they are missing you! What a fabulous experience you have shared with your boys. Blessings and thanks from your Henry’s 2nd cousin, Mel. So glad you “stopped by.” We are looking forward to getting home and seeing Big Henry, Mogie, and other family and friends! We leave Ireland for Livingston on October 7. Hard to believe this year is almost over! Your post is a one stop blog for anyone planning a detailed Stockholm tour. I never knew it is more of an island city. It feels so bad when food is expensive. I normally dislike cooking, more so when I am travelling. But the good thing about cooking own food while travelling is that we get to shop from local markets and interact with locals the way the ‘actual’ locals do! The archipelago tour and Birka Viking village tour sounds so unique and interesting! This is really a very thoughtful itinerary. In fact, it can be broken into smaller itineraries for those who are short on time. I also love your photographs. Great perspectives! Thanks! I was hoping it could be used that way. Have never been to Stockholm but planning a visit soon. Thanks for sharing some tips. I think the restaurants are outrageously expensive in a lot of countries in Europe. I liked the idea of shopping and cooking, good way to save money as well as eating healthy. The Thousand Island Cruise looks really interesting. Bookmarked your post to refer in future! So glad you found it useful. Yes, Europe is expensive as a whole, but I think Sweden is even pricer. Though I hear it is cheap compared to Norway ;).